Reading and share top 324 famous quotes and sayings about Academic by famous authors and people. Browse top 324 famous quotes and sayings about Academic by most favorite authors. 1. "I tried to oppose the academic to the marketplace." 2. "As an academic, this was not the lifestyle I had planned for myself. Now I see myself everywhere." 3. "Writing on the blog, you want to get attention and make strong claims. In academic work, that often doesn't pay, so sometimes it's a little bit difficult going back and forth to navigate these differences." 4. "I am joining the government not from the academic position but from St. Petersburg city council." 5. "Randomisation is not a new idea. 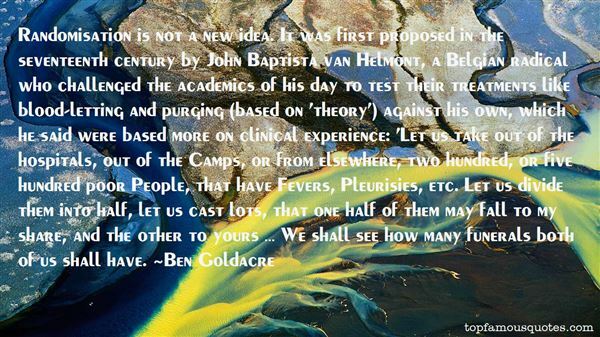 It was first proposed in the seventeenth century by John Baptista van Helmont, a Belgian radical who challenged the academics of his day to test their treatments like blood-letting and purging (based on ‘theory') against his own, which he said were based more on clinical experience: ‘Let us take out of the hospitals, out of the Camps, or from elsewhere, two hundred, or five hundred poor People, that have Fevers, Pleurisies, etc. Let us divide them into half, let us cast lots, that one half of them may fall to my share, and the other to yours … We shall see how many funerals both of us shall have." 6. "If the world is to go beyond a curiosity well-guarded by cynicism in either academic tweeds or vulgar rap, YOUR POWER MUST BE EVIDENT IN MEETING MATERIAL NEEDS. And it can't just happen once. The world has seen us fail to make the difference here as a habit and an institution, so it needs to see us be that faithful conduit on the same scale." 7. "All too often, academic departments defend their territory with the passion of cornered animals, though with far less justification." 8. "Dr. Lois Jolyon West was cleared at Top Secret for his work on MKULTRA. West's numerous connections to the mind control network illustrate how the network is maintained, not through any central conspiracy, but by an interlocking network of academic relationships, grants, conferences, and military appointments. Some doctors in the network were not funded directly by the CIA or military, but their work was of direct relevance to mind control, non-lethal weapons development, creation of controlled dissociation and the building of Manchurian Candidates." 9. "I'm an academic. It's publish or perish." 10. "Whether white, black, Asian, or Latino, American students rarely arrive at college as habitual readers, which means that few of them have more than a nominal connection to the past. It is absurd to speak, as does the academic left, of classic Western texts dominating and silencing everyone but a ruling elite or white males. The vast majority of white students do not know the intellectual tradition that is allegedly theirs any better than black or brown ones do. They have not read its books, and when they do read them, they may respond well, but they will not respond in the way that the academic left supposes. For there is only one ‘hegemonic discourse' in the lives of American undergraduates, and that is the mass media. Most high schools can't begin to compete against a torrent of imagery and sound that makes every moment but the present seem quaint, bloodless, or dead." 11. "I was born to a Nigerian dad and a Kenyan mom, and coming to the States was really academic." 12. "I went to a very academic school that actually - when I got to the point of wanting to pursue acting, they just had no idea how to do that, because all of their contacts were very academic." 13. "The PhD system is the real root of the evil of academic snobbery. People who have PhDs consider themselves a priesthood, and inventors generally don't have PhDs." 14. "Simplicity, for reasons that are a little bit obscure, is almost not pursued, at least in the academic world." 15. "A society that thinks the choice between ways of living is just a choice between equally eligible 'lifestyles' turns universities into academic cafeterias offering junk food for the mind." 16. "I am going to bed. i will have nightmares involving huge monsters in academic robes carrying long bloody butcher knives labeled Excerpt, Selection, Passage, and Abridged." 17. "I had to run away from home in order to be a musician. Because I came from a family of... my father was a health inspector; my mother was a social worker. And I was pretty smart in school. So they expected me to be some kind of academic - schoolteacher, or doctor, lawyer - and they were very disappointed when I told them I wanted to be a musician." 18. "The cards are stacked (quite properly, I imagine) against all professional aesthetes, and no doubt we all deserve the dark, wordy, academic deaths we all sooner or later die." 19. "I still feel threatened by academics, but my books have a lot of academic in-jokes and everybody assumes I went to university and studied English." 20. "... I succeeded at math, at least by the usual evaluation criteria: grades. Yet while I might have earned top marks in geometry and algebra, I was merely following memorized rules, plugging in numbers and dutifully crunching out answers by rote, with no real grasp of the significance of what I was doing or its usefulness in solving real-world problems. Worse, I knew the depth of my own ignorance, and I lived in fear that my lack of comprehension would be discovered and I would be exposed as an academic fraud -- psychologists call this "imposter syndrome"." 21. "It's not politically correct to say that you love one child more than you love your others. I love all of my kids, period, and they're all your favorites in different ways. But ask any parent who's been through some kind of crisis surrounding a child--a health scare, an academic snarl, an emotional problem--and we will tell you the truth. When something upends the equilibrium--when one child needs you more than the others--that imbalance becomes a black hole. You may never admit it out loud, but the one you love the most is the one who needs you more desperately than his siblings. What we really hope is that each child gets a turn. That we have deep enough reserves to be there for each of them, at different times.All this goes to hell when two of your children are pitted against each other, and both of them want you on their side." 22. "It's too much to expect in an academic setting that we should all agree, but it is not too much to expect discipline and unvarying civility." 23. "Balanced atop the highest spire of the Salt Lake Temple, gleaming in the Utah sun, a statue of the angel Moroni stands watch over downtown Salt Lake City with his golden trumpet raised. This massive granite edifice is the spiritual and temporal nexus of the Church of Jesus Christ of Latter-day Saints (LDS), which presents itself as the world's only true religion. Temple Square is to Mormons what the Vatican is to Catholics, or the Kaaba in Mecca is to Muslims. At last count there were more than eleven million Saints the world over, and Mormonism is the fastest-growing faith in the Western Hemisphere. At present in the United States there are more Mormons than Presbyterians or Episcopalians. On the planet as a whole, there are now more Mormons than Jews. Mormonism is considered in some sober academic circles to be well on its way to becoming a major world religion--the first such faith to emerge since Islam." 24. "The days that followed passed slowly. I lay in my hotel room and watched the kind of strange European TV that would probably make perfect sense if I understood the language, but because I didn't, the programs just seemed dreamlike and baffling. In one studio show a group of Scandinavian academics watched as one of them poured liquid plastic into a bucket of cold water. It solidified, they pulled it out, handed it around the circle, and, as far as I could tell, intellectualized on its random misshapenness. I phoned home but my wife didn't answer. It crossed my mind that she might be dead. I panicked. Then it turned out that she wasn't dead. She had just been at the shops." 25. "There is a belief advanced today, and in some cases by conservative black authors, that poor children and particularly black children should not be allowed to hear too much about these matters. If they learn how much less they are getting than rich children, we are told, this knowledge may induce them to regard themselves as "victims," and such "victim-thinking," it is argued, may then undermine their capacity to profit from whatever opportunities may actually exist. But this is a matter of psychology-or strategy-and not reality. The matter, in any case, is academic since most adolescents in the poorest neighborhoods learn very soon that they are getting less than children in the wealthier school districts. They see suburban schools on television and they see them when they travel for athletic competitions. It is a waste of time to worry whether we should tell them something they could tell to us. About injustice, most poor children in American cannot be fooled." 26. "I think academics are infuriating. For every expert on Shakespeare there is another one to cancel his theory out. It drives you up the wall. I think the greatest form of finding out the truth is through fantasy." 27. "Outside of school, though, we were often defined by our disabilities. We were "handicapped"—a bit like a species. Often when people have a disability, it's the disability that other people see rather than all the other abilities that coexist with their particular difficulty. It's why we talk about people being "disabled" rather than "having a disability." One of the reasons that people are branded by their disability is that the dominant conception of ability is so narrow. But the limitations of this conception affect everyone in education, not just those with "special needs." These days, anyone whose real strengths lie outside the restricted field of academic work can find being at school a dispiriting experience and emerge from it wondering if they have any significant aptitudes at all." 28. "Four years of football are calculated to breed in the average man more of the ingredients of success in life than almost any academic course he takes. -Knute Rockne"
29. "Give those who are gentle strength,Give those who are strong a generous imagination,And make their half-truth true and let the crooked Footpath find its parent road at length....For never to beginAnything new because we know there is nothingNew, is an academic sophistry--The original sin.I have already had friendsAmong things and hours and peopleBut taking them one by one--odd hours and passing people;Now I must make amendsAnd try to correlate event with instinctAnd me with you or you with you with all,No longer think of time as a waterfallAbstracted from a river." 30. "The Nazis had been one thing. The communists were another. But now there were academics crawling all over the palace." 31. "I come from an academic background. I wasn't raised to be into promoting myself." 32. "My career in academic research has not been involved with active management of securities. I've tried to understand risk-and-return relationships; also the pricing of derivative securities." 33. "The best philosophers were not academics, but had another job, so their philosophy was not corrupted by careerism." 34. "[As part of Camus' refusal to debate his political enemies publicly after their vitriolic responses to the publication of 'The Rebel'] At this point, the least sentence I might say will be used in a way that disgusts me in advance. ... It would be impossible for me in that case to continue expressing myself with academic politeness. I am mistaken for a deliberately polite man whom one may insult in all safety." 35. "I'm always involved with the Aerospace Program and NASA and Goddard Space Flight Center. And if kids feel so inclined, they can log onto NASA and the Optimus Prime Spinoff Award, which we present every year to some of the brilliant young minds that are taking up into the academics of space, science, technology, math." 36. "The notion of literature as only one of several avenues to a single typeof propositional knowledge is, of course, hardly the winning ticket in lit-crit today. More typical are sentiments that see such a notion as not even admissible, if at all desirable. The world of these academic refuseniks is, however, a bleak and sterile place. Disarmed by their own epistemic fiat, scholars cannot assert anything since they deny the idea of objective rationality. If they arrive at an insight whose truth they wish to defend – for example that truth and rationality are passé – they can't do so because truth and rationality are constructed to be constructed." 37. "At that time, the academic orientation was rather technical contrary to that of the university, where art theory is very important. The teachers were renowned artists and among the best of that time." 38. "…I've seen the world tell us with wars and real estate developments and bad politics and odd court decisions that our lives don't matter. That may be because we are too many. Architecture and application form, modern life says that with so many of us we can best survive by ignoring identity and acting as it individual differences do not exist. 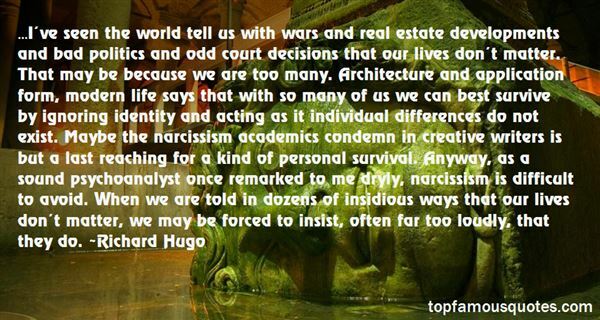 Maybe the narcissism academics condemn in creative writers is but a last reaching for a kind of personal survival. Anyway, as a sound psychoanalyst once remarked to me dryly, narcissism is difficult to avoid. When we are told in dozens of insidious ways that our lives don't matter, we may be forced to insist, often far too loudly, that they do." 39. "A genius is someone who takes a complex thing and makes it look simple. An academic does the opposite." 40. "Johnson's later life, from 1763, is among the best documented of all literary lives. James Boswell gave himself the enormous task, after Johnson's death in 1784, of producing what is now held to be a model of biography; rich in detail and anecdote, a complete picture of the man and his times, traced over a period of more than twenty years. Boswell's Life of Johnson, published in 1791, carries on Johnson's own contribution to the growing art of biography, and consolidates Johnson's position as a major literary figure, who, although a poet and a novelist, is remembered more for his academic and critical achievement than for his creative writings." 41. "Ah God! to see the branches stir	Across the moon at Grantchester! To smell the thrilling-sweet and rotten	Unforgettable, unforgotten	River-smell, and hear the breeze	Sobbing in the little trees. Say, do the elm-clumps greatly stand	Still guardians of that holy land? The chestnuts shade, in reverend dream,	The yet unacademic streamIs dawn a secret shy and cold	Anadyomene, silver-gold? And sunset still a golden sea	From Haslingfield to Madingley? And after, ere the night is born,Do hares come out about the corn? Oh, is the water sweet and cool,	Gentle and brown, above the pool? And laughs the immortal river still	Under the mill, under the mill?Say, is there Beauty yet to find? And Certainty? and Quiet kind? Deep meadows yet, for to forget	The lies, and truths, and pain?… oh! yet	Stands the Church clock at ten to three? And is there honey still for tea?" 42. "I am among the few who continue to draw after childhood is ended, continuing and perfecting childhood drawing - without the traditional interruption of academic training." 43. "For example, a few years ago, a great French philosopher, Roger Garaudy, wrote a scientific book. He did not offend, curse, or insult anyone. He wrote a scientific research of an academic nature, in which he discussed the alleged Jewish Holocaust in Germany. He proved that this Holocaust is a myth." 44. "But the vast majority of books ever written are not accessible to anyone except the most tenacious researchers at premier academic libraries. Books written after 1923 quickly disappear into a literary black hole." 45. "I was very academically inclined. But my inner life was in such turmoil. I'd go home and my home life was so miserable that it just felt like I was doing everything that I was supposed to do. I did all my chores, made really good grades, and I was excelling at school, but I wasn't happy." 46. "When I was 13, I won a scholarship to boarding school. My parents let me choose whether to go, and I decided I wanted to. Afterwards, I went to Cambridge to study law - in a way, I was carrying the academic hopes of my family, as Mum and Dad left school at 14." 47. "DURING THE PAST TWO TO THREE DECADES, we have acquired substantial evidence that most chronic diseases in America can be partially attributed to bad nutrition. Expert government panels have said it, the surgeon general has said it and academic scientists have said it. More people die because of the way they eat than by tobacco use, accidents or any other lifestyle or environmental factor." 48. "I didn't have friends. No one talked to me. I used to go to the Wyndcroft School (nationally recognized for academic excellence) in Pottstown, and when I moved to Wyomissing, I didn't know anybody." 49. "A te închipui un element necesar în ordinea universului echivaleaza, pentru noi, oamenii cu lecturi serioase, cu ceea ce e supersti?ia pentru analfabe?i. Nu se schimba lumea cu ideile. Persoanele cu pu?ine idei sunt mai pu?in supuse erorii, se iau dupa ceea ce fac to?i ?i nu deranjeaza pe nimeni, ?i reu?esc, se îmboga?esc, ajung la pozi?ii solide, deputa?i, oameni cu decora?ii, oameni de litere renumi?i, academicieni, jurnali?ti. Po?i sa mai fii nerod când î?i faci a?a de bine propriile afaceri? Prostul sunt eu, care am vrut sa ma bat cu morile de vânt." 50. "Under the discipline of unity, knowledge and morality come together. No longer can we have that paltry 'objective' knowledge so prized by the academic specialists. To know anything at all becomes a moral predicament. Aware that there is no such thing as a specialized effect, one becomes responsible for judgments as well as facts. Aware that as an agricultural scientist he had 'one great subject,' Sir Albert Howard could no longer ask, What can I do with what I know? without at the same time asking, How can I be responsible for what I know?" Worry was my mother's mechanic, her mechanism for engaging with the machinery of living. Worry was an anchor for her, a hook, something to clutch on to in the world. Worry was a box to live inside of, worry a mechanism for evading the present, for re-creating the past, for dealing with the future." Who Was Talking About "Academic"?